If you follow me on Instagram, you've gotten a few sneak peeks of my budding gallery wall, but today I'm excited to share its growth with all of you! I've been collecting art, prints, and other small mementos for just over a year, and finally bit the bullet to buy some frames (from Goodwill!) and begin hanging things up. Isn't it coming along nicely?! Collect pieces over time. 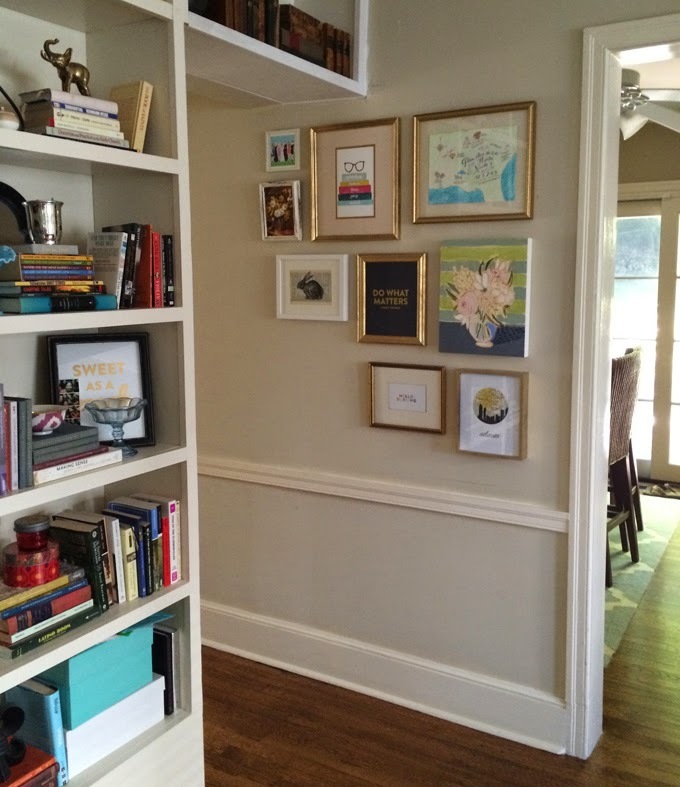 A gallery wall doesn't happen over night, so don't expect it to. Buy what you love. I know this is an easy one, but part of collecting over time is an ability to get what you really want and truly love. The good news is that your taste is the same, so your pieces will come together nicely and will look collected which is the goal. If you're on a budget, Goodwill is your new best friend. I've purchased 10, yes 10 frames for under $30. Sure, we had to take them apart, spray paint the heck out of them, and figure out a way to put them back together again, but it was fun...and cheap! Don't be afraid to mix and match your frames. I've got shades of white and gold, and it's all working together. Invest in one really nice piece of art to use as your focal/starting point. For me, it was my custom Lulie Wallace. Check out up and coming artists like Britt Bass & Teil Duncan for beautiful pieces. love the way your wall is coming together! I've got one slowly growing in my bedroom, and I've only recently started purchasing art and adding it to my own crafts and etc! I just commissioned a memorial painting of my dog and I couldn't be more excited about that! Etsy is definitely a treasure trove when it comes to art, and it feels great to support artists that are doing what they love! I definitely need to take a peek at thrift stores for frames and things. Good tip!